The Simply Complex Blog: Is the Divided Path and Repeater Limit of 200 in Revit a Problem? Want More? Use DynamoBIM! Is the Divided Path and Repeater Limit of 200 in Revit a Problem? Want More? Use DynamoBIM! 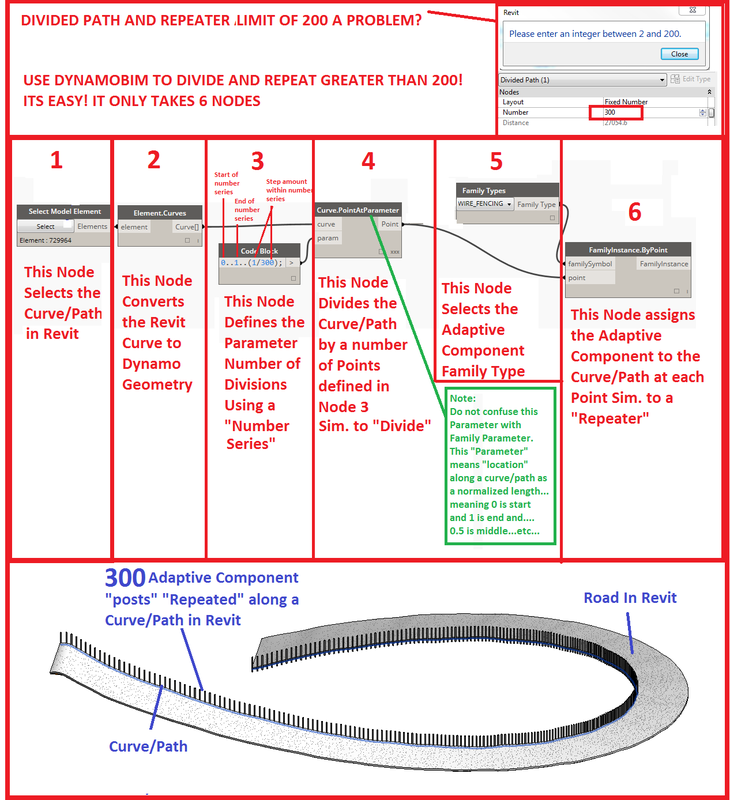 Currently in Revit you are only allowed to divide a curve/path between 2 and 200. What if you want more divisions? Use DynamoBIM! Its easy and it only takes 6 nodes. Follow the steps below. Draw a curve or path that you want. Open DynamoBIM from your project and add the 6 nodes you see in the image. Good luck adding as many AC repeaters as you like! I have copied your nodes but my family is only placed at the first point in the sequence. Any ideas what might be wrong? is your point.at.parameter node lacing set to cross product? Ah, brilliant, that fixed it. Thanks Marcello, excellent tutorial. import instance only works on solids because ... its an sat import i blogged about it earlier. Please reference that post. Thanks! Lets make it more complex. What If I have 4 curves, and an adaptive component with 4 adaptive placement points. Is it possible to handle this?